For luxurious comfort you'll love slipping into, our Front Zip Velour Robe is a cozy classic. Slipping into it is easy, and this ultra-soft robe offers full-length coverage perfect for lounging. 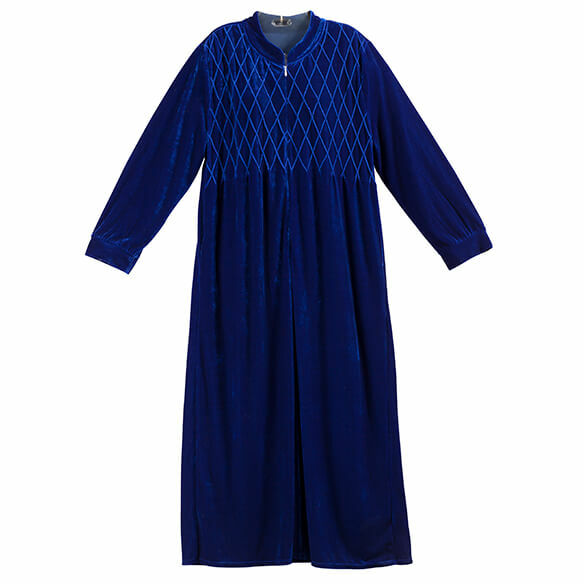 Designed in a rich shade of royal blue, it features long sleeves, a subtle diamond pattern on front and back yoke. I need a new robe and this is the type robe I prefer. I am hoping for a full front zip robe in a warm fabric as I live in the woods on the coast which is always cold! I am hoping this is not a step in robe which I can not do! Also would like a thick quality fabric! Is this a full zipper top to bottom? Or is this a "step in" type zipper?